Arka found his way into professional acting when he entered the regional Youth Shakespeare Festival in high school and in the following year won first place in the duologue category. Throughout university he appeared in various plays, culminating in References to Salvador Dali Make Me Hot at The Griffin Theatre directed by Anthony Skuse to much critical acclaim. He made his debut with the Ensemble Theatre in Animals Out of Paper, for which he was nominated for Best Newcomer at the Sydney Theatre Awards. He returned to the Ensemble for Casanova, then appeared in Beached at the Griffin Theatre alongside a star-studded cast. Arka then starred as Farid in the AACTA winning ABC series The Code and has since moved into working on feature films. Most notably he starred in the co-lead role of TK in the Australian feature film UnIndian - a selection at the Montreal World Film Festival and released in cinemas in Australia, India and the Middle East. He recently worked on See-Saw Films and Weinstein Co.'s feature Lion, alongside Dev Patel, Rooney Mara and Nicole Kidman. Other credits include roles in Australian feature films, Down Under by Abe Forsythe, and a screen adaptation of Helen Garner's bestseller — Joe Cinque's Consolation directed by Sotiris Dounoukos. Arka will also appear in Season 2 of award-winning series Top of the Lake directed by Academy Award winner Jane Campion. Arka has also been writing and directing, with web-series content, documentaries, and short films under his belt, and is hoping to continue creating more exciting and diverse content for TV and film in the future. Tabb is an intern and new to the hospital. 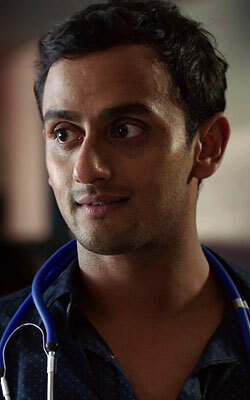 Beneath the quick wit and a sense of humour that puts everyone at ease, he doubts his abilities as a doctor. Why shouldn't he, when he finds himself at the centre of every disaster?